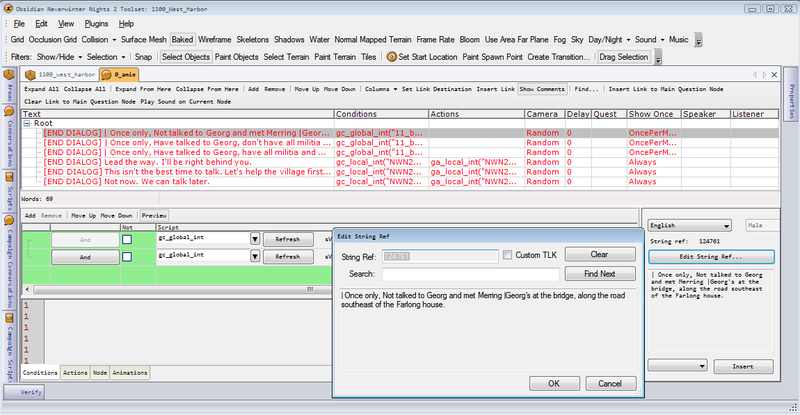 The Flamewind Conversation Editor is now available to use with NWN1 & NWN:EE. Updated features include conversation text spell checking. NWN2 users may also be interested because it is fully backwards compatible. Seeing as this uses .net would I be right in thinking it is written in one of the visual studio languages? I only ask as the new full release of the visual studio 2019 community edition (aka the free version) platform went live a few days ago and I am currently in the process of downloading it. See this page for details. It has the download button on it, just select community. That’s correct! It’s written in C#, matter of fact. The version 1 source code was released by Kethlak here. What I’ve done is, with author’s permission modified that code to produce my own version. C# is something I’m intimately familiar with. Similarly, I plan to release my modified code, although I haven’t decided whether to put it on github or just in a zip yet. I’d encourage you to check out the V1 source, maybe there’s some feature you’d like to add for module builders? Now a question to the community. How did Bioware do that? There’s no way to add .tlk references to conversation nodes through the toolset. If this is something people want to do, it can be added to Flamewind. There’s no way to add .tlk references to conversation nodes through the toolset. Oh good! I guess I can get a copy of NWN2 and model the add tech based on that. Unfortunately I haven’t looked at the Electron Toolset plugin at all, so this feature won’t benefit NWN2 players. 2.0.2 is now available. It allows you to add tokens like <StartAction> to conversations. But it goes one better by allowing you to add them to selected text and use keyboard shortcuts for faster editing.